It's interesting that practically every ethnicity has some form of pocket food. Empanadas, pierogis, pirozhki, bierocks, calzones, knish, mince pies, samosas, potstickers, and--gasp--hot pockets (do those even count?) are just a few examples. I'm continually trying to learn and make family recipes. My dad and his cousins are first generation Americans. My grandparents and great aunts and uncles immigrated from Germany and Russia to Chicago. Growing up, my dad would often talk about family gatherings and reminisce about the different dishes that everyone brought. Potato chips with dip, deviled eggs, and "pigs in a blanket" did not make appearances at those gatherings. ;) Rather, everyone sought out ingredients from the ethnic areas around Chicago and created traditional German and Russian dishes. One of my great aunts (she truly is great!) 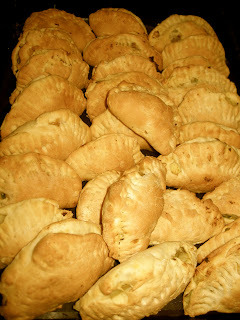 often made Russian pirozhki, which is like a baked stuffed bun. Since I have not cooked or baked any Russian foods, pirozhki was on my "baking list" for a while, so I finally gave it a go one Sunday afternoon. You could go sweet or savory with the stuffing combinations. The stuffing combinations are endless. This time, I went the savory route and used cabbage with hard-boiled eggs, as that is one of the traditional combinations. The bread around the filling is light and just yummy! These are delicious plain, but mustard makes a great dip. These can be a little time consuming to make, but I'm sure that making them gets easier with more practice. After tasting these, I understand why my Aunt Galena often made these for family gatherings. Pirozhki just have that "comfort food" taste. Every holiday and family gathering has a foundation built on traditions. The majority of these traditions often center around food. Everyone has their favorite dishes which bring recollections of time cooking with family and sharing meals. I think cooking has a magical ability to keep this traditions with every new generation. It will be fun to keep the traditions going! Place 1/2 cup of the warmed milk into a small bowl. Stir in sugar and sprinkle the yeast over the top of the milk. Set aside until foamy, about 10 minutes. Pour the remaining milk into a large bowl. In a large bowl (preferably in a stand mixer), add the melted 2 tbsp. butter, egg, salt, and 1 cup of flour. Mix until combined (if you are using a stand mixer, use the paddle attachment). Add in the yeast mixture. Mix in 1 cup of flour at a time, until the dough begins to pull away from the side of the bowl and does not stick to your hands. Cover the bowl loosely with plastic wrap, and set in a warm place to rise for about 1 hour. The dough should nearly triple in size. Preheat oven to 400ºF. While the dough rises, melt the remaining butter in a large skillet over medium head. Add the cabbage and cook, stirring frequently, until the cabbage has wilted. Mix in the eggs, and season with salt and pepper. Continue to cook, stirring occasionally until cabbage is tender. Set this aside for the filling. Place the risen dough onto a flour surface, and gently form the dough into three large cylindrical shapes, about 2 inches wide (the dough should look like snakes!). Cut into 1 inch pieces and roll each piece into a ball. Flatten the balls by hand until they are 4 to 5 inches in diameter. Place a spoonful of the cabbage filling in the center and fold in half to enclose. Pinch the edges together to seal in the feeling. Line two baking sheets with aluminum foil. Place the pirozhki onto the baking sheet, leaving about an inch between them. Bake for 20 minutes, or until golden brown. These look so good! I love the filling - it sounds delicious.